Hydrogen peroxide is a colorless and odorless liquid. Suppliers produce various concentrations depending on the application. The main use for hydrogen peroxide is as a bleaching agent for the textile and paper industry. Hydrogen peroxide is a corrosive chemical requiring care when handling and storing the product. The fact that it is a colorless liquid without a distinct odor makes it difficult to identify by observation. Label containers to warn people of the contents. What are the Applications for Hydrogen Peroxide? The textile industry uses hydrogen peroxide for bleaching cotton. It is a highly effective agent for bleaching protein fibers. Bleaching happens by immersing the cotton in a hydrogen peroxide solution. The process requires specific pH and temperature set points to be successful. Hydrogen peroxide is also common in the pulp and paper industry. It produces a high-quality brightness in paper that remains stable for a long time. Hydrogen peroxide is superior to other bleaching agents. It is also friendlier to the environment and more economic than the alternatives. Hydrogen peroxide occurs in cosmetic products like hair dyes, conditioners and shampoos. At low concentrations it is also found in antiseptic products. What are the Hazards of Hydrogen Peroxide? Hydrogen peroxide is not flammable. But, it is a strong oxidizing agent – especially when exposed to high temperatures. This means that it releases oxygen, which has the effect of accelerating a fire. It may cause spontaneous combustion or even an explosion when contacted by organic material. The corrosive nature of hydrogen peroxide makes it toxic for humans. Exposure causes severe skin burns and eye damage. It may also irritate the respiratory system. How Should You Store Hydrogen Peroxide? Because of its oxidizing characteristics, segregate hydrogen peroxide from flammable chemicals. Store away from incompatible chemicals to prevent reactions. Seal storage containers tightly to prevent accidental exposure. If storing hydrogen peroxide along with other chemicals, use fire-rated chemical storage buildings. 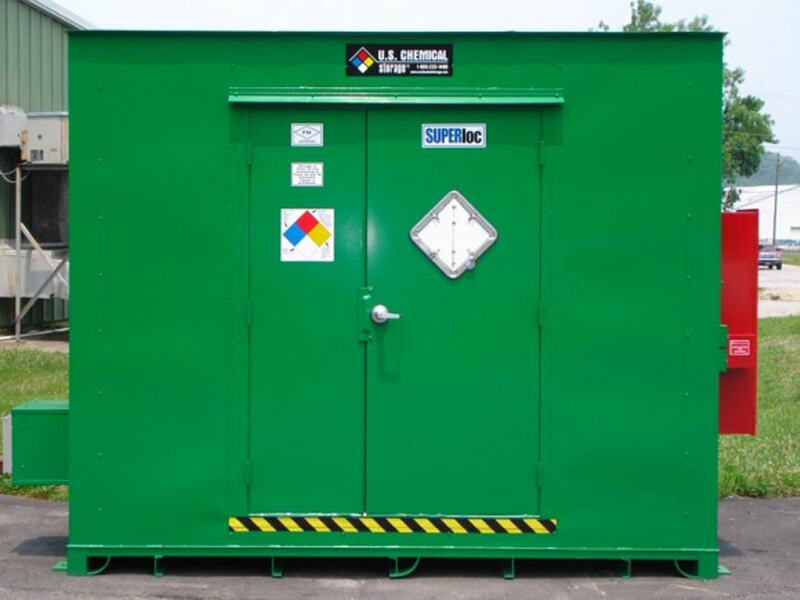 Our SUPERloc 4-hour fire rated and FIREloc 2-hour fire rated buildings allow safe Class 1A Flammable Chemical Storage and/or mixing of Class 1B Flammable Chemicals to occur closer to your facility. SUPERloc buildings even allow storage of flammable materials inside an occupied building (subject to local regulations). When heated, hydrogen peroxide becomes unstable and decomposes. Add climate control options to prevent it from oxidizing and starting a fire. If you need to store hydrogen peroxide in IBC or drums away from occupied buildings or property lines, a non-fire-rated chemical storage building is appropriate. Their robust construction and secondary containment sumps ensures that no spill of product escapes the storage building. Contact U.S. Chemical Storage for a free quote for safe and compliant hydrogen peroxide storage solutions. Our expert team understand the hazards involved and the regulatory requirements. We help you evaluate the best chemical storage building for the combination of chemicals you use on site.